Coincidently, both have to do with your value and self-worth. The first verse shows that you are a pearl of great value. Jesus found you, and gave everything, including His life, to ‘buy you.’ Your value is so high, there was not even a monetary price that could be paid. He had to give His life to secure you. With that thought in mind, the second verse comes into play. 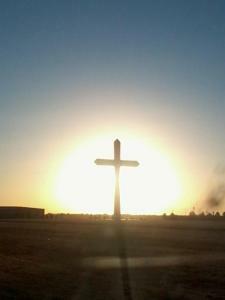 He paid for you with His life. You are worth that much. Why do we let others treat us as ‘less than’? Our value and worth rest solely in Jesus. We are a pearl of great price. Why then, do we sometimes throw our pearls before swine? Why do we feel that it is okay to be talked down to, or abused, or talked to in a manner that is disrespectful? Why do we listen to others who talk down to us? When we value ourselves, and see ourselves the way The Father and Jesus see us, our whole world changes. We are princes and princesses of The Kingdom. Would anyone be able to disrespect the prince/princess of any kingdom? Why do we let others do that to us? Do the prince and princess just sit behind the walls doing their own thing? No. They are trained to represent the kingdom. They are taught and educated to be ambassadors when sent out. They fight for, and look after their kingdom. They take their responsibilities seriously. When they find people from another town, or from outlying areas being attacked, they go out and get them and bring them back to the safety of the kingdom. When they see and injustice done to one from their kingdom, they don’t hesitate to put a stop to it. That is our job as princes and princesses of the Kingdom of God. We are to look out for each other. We are to be ambassadors for the Lord. We are to go out and get those who are hurt, battered, or beaten. We are to do this all while representing The Kingdom. We are children of Lord God Almighty! We were bought with the blood of Jesus! We are all pearls of great price! God is faithful, even when His children are lost and wandering. When I needed Him most, the Lord was there for me. He led me out of that danger and into a new life…a life where I am loved and appreciated. He taught me what ‘real love’ is, and what it’s supposed to look like through my family and wonderful husband. Who knew that “Prince Charming” actually existed? I hoped and prayed he was out there, and I found him! He is a 24 year Navy veteran and the love of my life! With his encouragement, I rediscovered the creativity I thought I had lost a long time ago, and have begun to publish the books I have written through the years. The words in these books helped me through my struggles, and my prayer is they will help others. 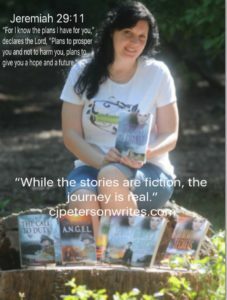 The way in which I write my Christian Books, is unique to say the least. I am a realistic Christian. People are people, they stumble, they fall, they trip, but God continues to dust us off, and set us back on the path again, if we just learn to trust in Him. The challenges faced in my past give me a perspective on the realities of living the Christian life that some people may never see. There are times we wander away from God…there are times when we draw closer to Him. In our arrogance we think we can make it on our own. However, the One who made this world, and who made you, has the answers, and thankfully, He forgives our impudence and petulance and loves us through it all. God is a God of love, mercy, grace, and guidance. He loves us and only wants the best for us. Those who have read my books, describe them as encouraging, frustrating, and a wonderful read all at the same time. The same character that could have you crying one minute, will have you cheering the next! One of my editors, stated that ‘she was so into the story, that she forgot to edit, and had to go back to do the editing’. I pray you will enjoy my books as well! While the stories are fiction, the journey is real.